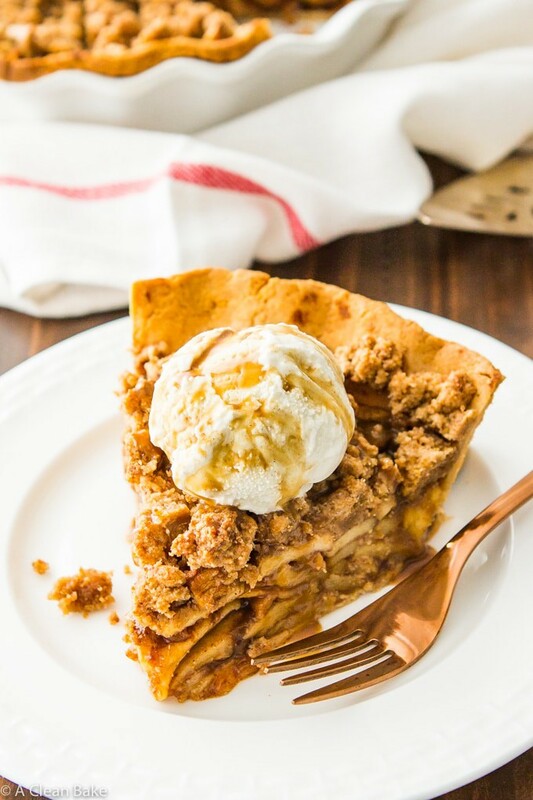 Paleo apple pie is much easier to make than you’d think when you fill a reliable grain free and low carb crust with three kinds of apples, warm cinnamon, and rich coconut sugar, and top it all with a thick layer of luscious crumb topping! Finish it with a dollop of ice cream and a drizzle of caramel sauce. 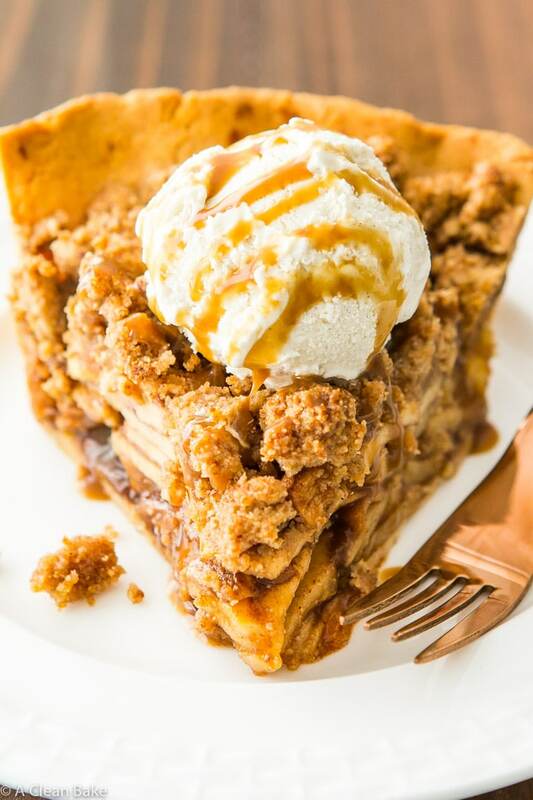 No one will believe this apple pie recipe is gluten free, grain free, and dairy free! I did promise you apple pie, didn’t I? And I would never break a promise that crucial. I don’t know why I don’t make pies more often, because they are so satisfying to pull out of the oven. And eat, too, of course. 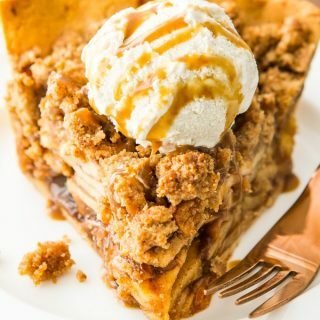 But nothing compares to the feeling of sliding a perfect, golden brown, warm apple pie out of the oven and deeply inhaling the aroma as you place it on the stovetop to cool, and try to avoid the urge to plunge a spoon into the center right away. Once you’ve waited for it to cool just enough to get to one degree below “sear your tongue so badly you regret it for days”, boy have you earned your slice. Maybe this is self-explanatory, but there are a couple of crucial differences between this and a traditional apple pie. While it looks pretty standard on the surface, rest assured it is (as always!) 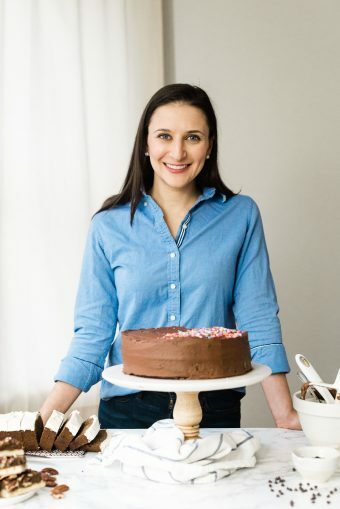 totally gluten free, grain free, refined sugar free, and paleo-friendly. You’ll make the dough in the food processor (let the machines do the work!) and roll it out between two pieces of wax or parchment paper. Then carefully transfer it to the pie plate and pre-bake for 10 minutes. Second, because pre-baking provides sort of a shield against the moisture of the filling. 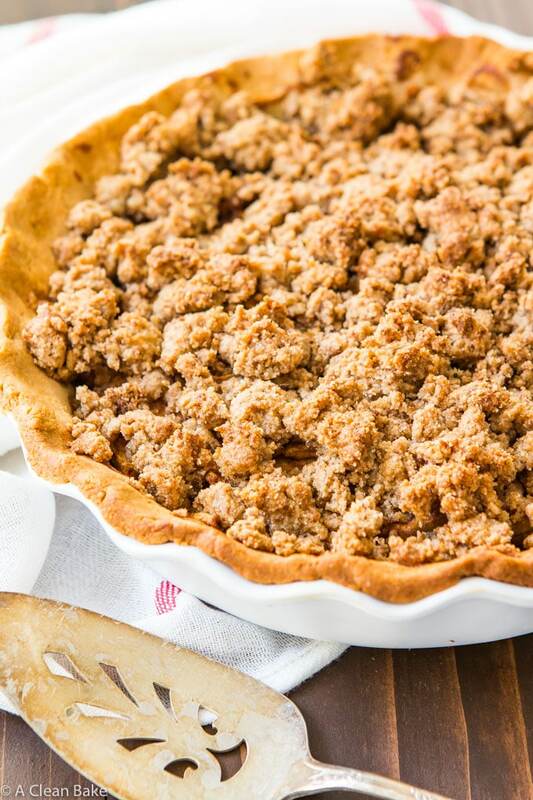 Without a little bit of the sturdiness that baking provides, the crust may absorb too much moisture from the filling while it is baking and end up a mushy mess, instead of the layer of pie reinforcement that it should be. This is a thin crust – just enough to support the apples without interfering – so it needs a little extra reinforcement. Good question. The method is simple: Press the crust into the pan and trim the edges or fancy it up however you want to (crimp it between your thumb and first and second fingers, if you want). Then, cover the crust with a layer of lightly greased parchment paper. Do not use wax paper! The wax will melt into the pie crust. No, thanks. Add your pie weights in to the cavity of the pie crust (the pie “shell”) , on top of the parchment. What’s that? You haven’t felt the need to invest $10+ on a unitasker? That’s ok. Me neither. Instead, I use dry kidney beans to fill my pie shells while they pre-bake. You casually find a 1-lb bag of them at the grocery store for around $0.99. A 90% savings? Yes please. You can use any type of beans that you want, but I like kidney beans best because they are so large. But once you’ve used them as pie weights, don’t eat them. Just let them cool completely and put them in a jar in the back of the cabinet for the next pie shell! It’s a pretty standard filling that I modeled after the way I used to see my mom make her pies (I don’t know if she ever used a recipe for the filling, actually, but I do!). Start with peeled, cored, and sliced apples. 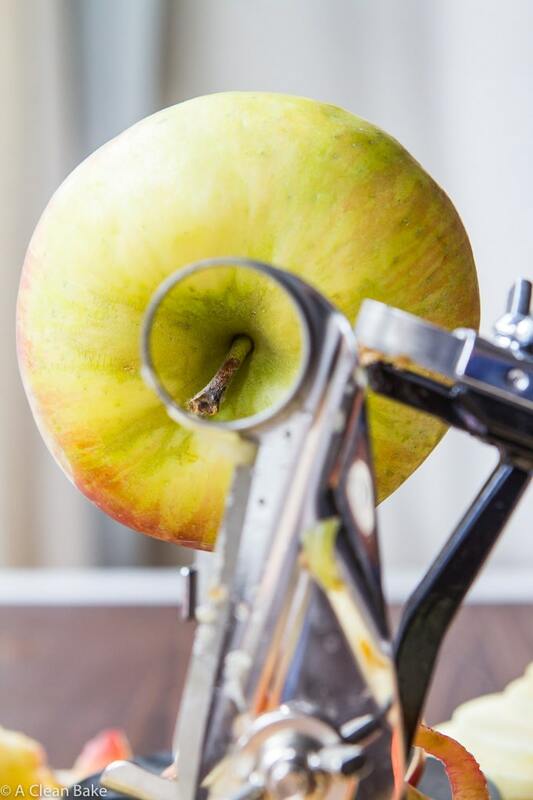 I will admit that my hand crank peeler/corer/slicer is one of the very few unitaskers that I allow in my kitchen, but it is so worth it when you want to make apple pie. Otherwise, I guess you get a good arm workout! I recommend semi-tart varieties of apples. 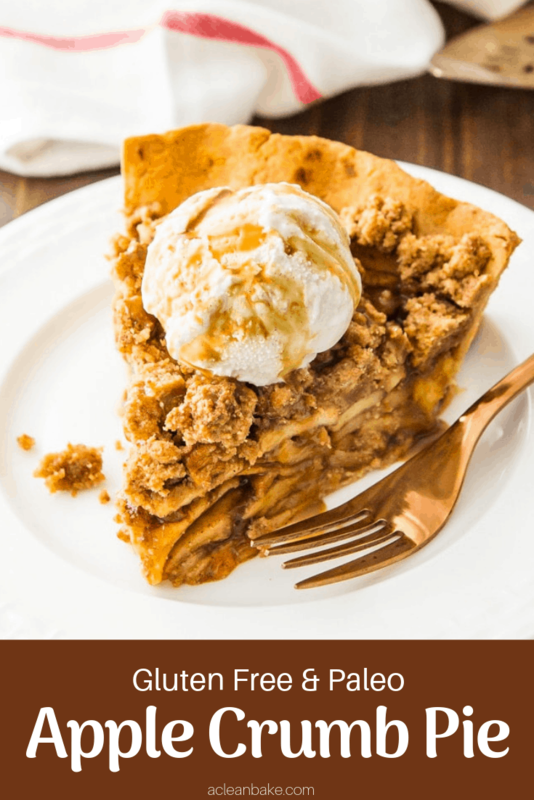 I used Honeycrisp, Cortlandt, and Granny Smith for this pie and it turned out beautifully – sweet enough without being too one dimensional. If you want more information on how to choose apples for pie, check out my friend Kristen’s in-depth tutorial. 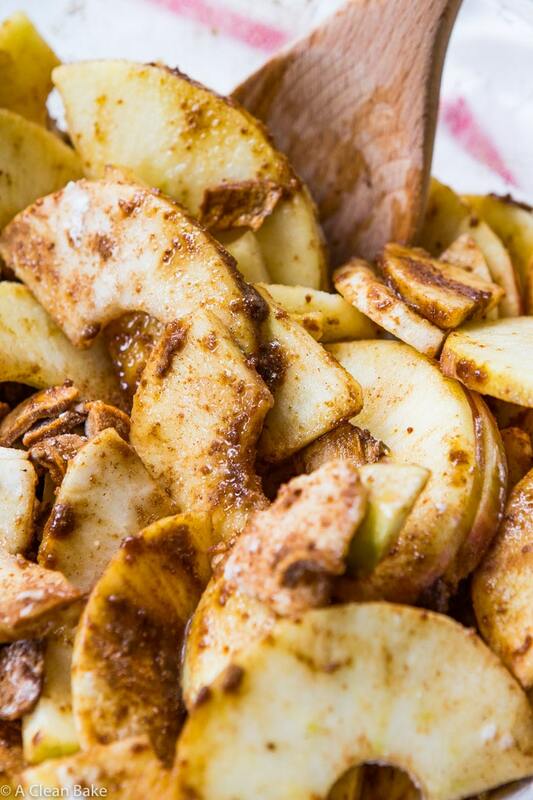 You’ll toss the prepared apples in a large bowl with coconut sugar (another paleo-friendly swap), fresh lemon juice (which brings out the sweetness), tapioca starch (which absorbs excess moisture in the filling), a ton of cinnamon, and… drumroll… a secret ingredient! Here’s a trick for taking the apple-y-ness of your apple pie to the next level: dried apples. Because they are dried, their apple flavor is super concentrated, so they add exponentially more apple-y-ness (how do you spell that word?!) without extra bulk or moisture. I chop them up pretty finely so that there are no awkward pieces in your bite of pie, and I swear, you don’t even know they’re there. You just taste maximum apple flavor. Once you’ve tossed together the quick filling, you’re going to make the crumb topping. It is a simple streusel “mix dry, mix wet, combine” scenario, but once you’re done – wow. It is heaven. You’ll want to eat it immediately, but resist! Muster all your self control and cover the pie with it. It is worth it, and you may never want to make a dough-lattice topped pie again once you’ve tried this streusel. A ton of information, I know, but since there are several components to this pie, I wanted to walk you through it! Thanks for sticking with me through almost 1,000 words about pie. 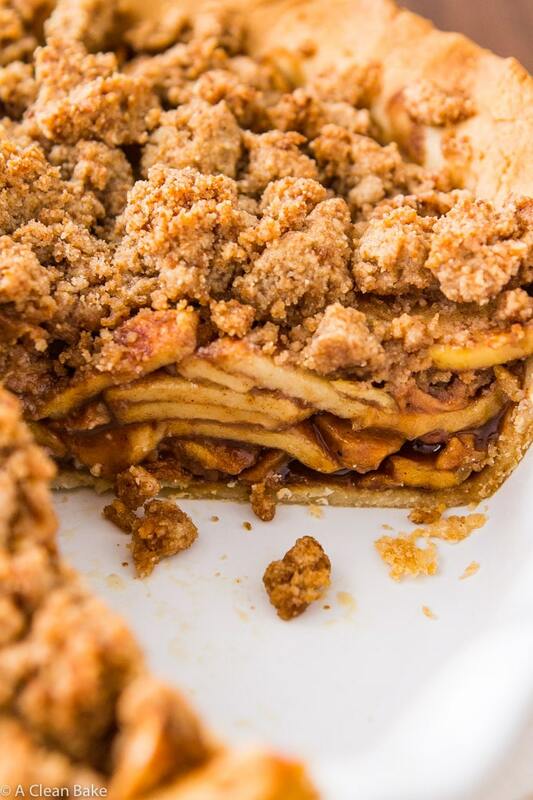 Paleo apple pie is much easier to make than you'd think when you fill a reliable grain free and low carb crust with three kinds of apples, warm cinnamon, and rich coconut sugar, and top it all with a thick layer of luscious crumb topping! Finish it with a dollop of ice cream and a drizzle of caramel sauce. No one will believe it's gluten free, grain free, and dairy free! Preheat the oven to 350°F. Lightly grease an 8 1/2 inch pie plate and set aside. In the bowl of a food processor fitted with the "s" blade, pulse together the almond flour, coconut flour, tapioca flour, and salt a few times, to combine. Add the egg, maple syrup and butter, and process until the dough comes together in a ball. Scrape down the sides once or twice to ensure everything is well combined. The dough will be sticky. Let sit 10 minutes for the dough to firm up. Turn the ball of dough out on to a piece of wax or parchment paper. Cover with another piece and roll out into a circle about 13" wide (the width of your pie plate's base + the length of two of the sides). Carefully pick up the dough and transfer it to the plate. Press it into the corners and trim the edges, or crimp them between your thumb and first two fingers. Cover the dough with a piece of parchment paper, and fill the shell with pie weights or dried beans. Remove from the oven and set aside to cool. Keep the oven on. In a large mixing bowl, toss together all of the ingredients until well combined. Pour the filling into the pre-baked and cooled pie shell and use a spatula to spread it into an even layer. Set aside. In a medium mixing bowl, whisk together the almond flour, coconut sugar, coconut flour, cinnamon and salt. Set aside. In a small bowl, whisk together the oil and maple syrup. Pour the wet mixture over the dry mixture and stir to combine. 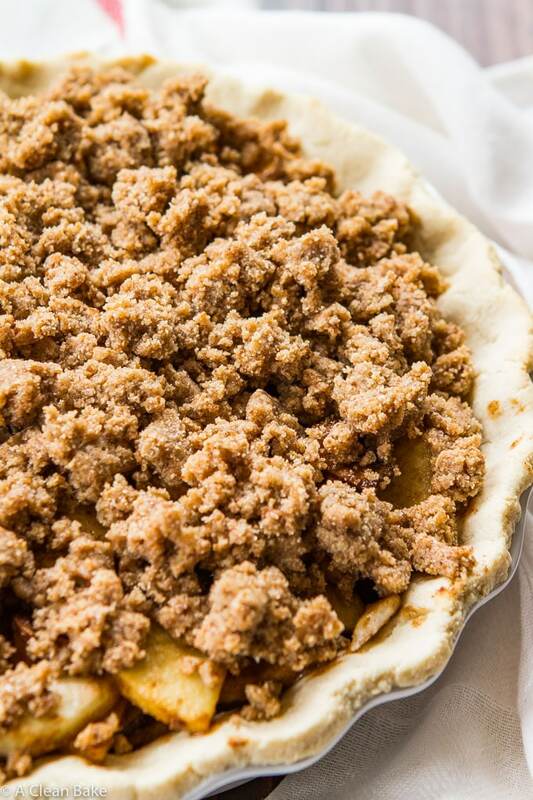 Use a spoon or your fingertips to drop dollops of crumble all over the top of the pie, covering all of the apples. Optional step: Whisk an egg with 1 Tablespoon of milk or water to create an egg wash. Brush the edges of the crust. This will produce a golden brown crust, but will also make it crisper. For a more tender edge, skip this step. Bake for 30 minutes. Then loosely cover the edges of the crust with tinfoil (or a shield) and bake for another 30 minutes or so, until the top is golden. Cool completely (or mostly) before serving. Check out more paleo recipes here! I might have missed this but what size pie plate did you use? Hi Aimee! I used an 8.5″ deep dish plate. If you use a standard 9″ plate, you should be fine! Have you tried your pie crust with an egg replacer? My daughter can’t have eggs and I’m trying to find a paleo crust she can eat. Thanks so much for this recipe. I can’t wait to try it for Thanksgiving! Hi Angie! I have not tried this with an egg replacer, so I’m not sure how it would turn out. But, I do have a vegan pie crust recipe that you may want to use instead. You can find it here. There is no sweetener in it (feel free to add a couple tablespoons of your granulated sweetener of choice). Be warned that it doesn’t hold together too well so you may have a bit of trouble getting the slices out of the pie plate. But otherwise, it should work! OMG! This looks so yummy! I can’t wait to try this! Super excited to make this healthier Apple pie. Can you make it in advance and freeze it? Thanks! Hi Cindy! Yes, you can make it ahead and freeze it, but the crust won’t be quite as crisp when you defrost it as it would be fresh. This is just what I wanted to do, it looks amazing! One question, can I make it a day ahead and refrigerate for the next day? Will it be good if I reheat it? You can make it a day ahead but the crust might get a bit soggy. I’d recommend saving the last 15-20 minutes of baking for the day you want to serve it (so par-bake it the day before, cool, cover and store in the fridge. Then bring it to room temp the next day before finishing baking). You’ll probably have to add a few extra minutes to the second day’s bake, so if you’re planning to bake for the last 15 minutes of the recipe, plan for 20-25. Hi Nora, thanks for the great recipe! Correct me if I’m wrong, but was the baking temp left out of the instructions? I couldn’t seem to find it anywhere. Thanks again! Hi Candice! The baking temp is 350 (see instruction #1). Hi is that one and a half cups of almond flour or one half cup? Hi! It’s one and a half cups. Thank you! I figured it out and this pie was absolutely delicious! Could you substitute butter for the coconut oil in the crumb top?